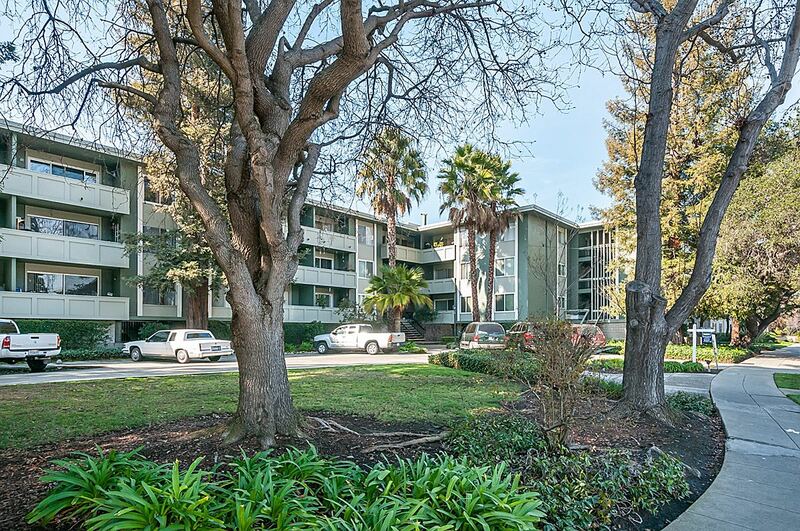 Conveniently located in Redwood City’s Palm Park neighborhood, this remodeled 2-bedroom 1 bath condo offers all the modern essentials for comfortable, contemporary living. The first floor, end unit opens up to a sun-kissed living room and updated gourmet kitchen. Residents will enjoy coveted granite countertops, as well as brand new fixtures and chic pendant lighting above the bonus bar seating. Accented by bamboo floors, dual-paned windows, and crown moldings, the communal space comes with direct access to a private patio. This outdoor nook features decorative flooring and adjustable screens, allowing residents to enjoy year-round views of Palm Park. Maximizing square footage, the master bedroom harbors a wrap-around, walk-in closet with a bonus vanity sink. The remodeled bath features a tub-shower, granite countertops and modern light fixtures. An illuminant secondary bedroom comes with equally impressive closet space with potential to transform into a home office. Situated in the Palm Park complex, residents are just steps away from the neighborhood park and enjoy exclusive access to the complex’s outdoor pool, communal barbecue, and recreational clubhouse. -Master bedroom features a new chrome ceiling fan, partial park views, as well as an en-suite walk-in closet and dressing room. -The brand new bath contains new fixtures, a tub-shower, and sleek granite countertops. -A secondary bedroom is lined with a vast floor-to-ceiling closet and a contemporary ceiling fan. -Communal facilities include a heated, outdoor pool and barbecue quarters alongside a private clubhouse. -Fitting for both professionals and small families, this first-floor condo sits across from Palm Park and enjoys convenient access to commuter routes. The tree-studded complex is also within two miles of Woodside Manor Shopping Center, Redwood City Elementary, Sequoia High School and Woodside High School.